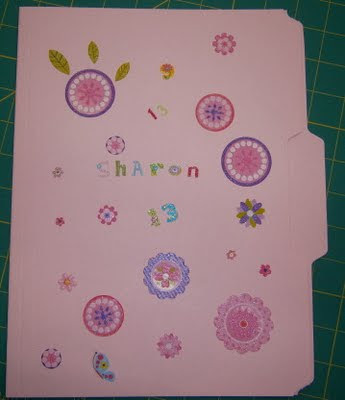 Sunshine, chocolate and needleturn applique...who could ask for anything more? We spent three days working on any combination of four designs. Some have decided to do all four, some only two, and some only one. There was no wrong answer! Here are three of the ladies working hard. Right outside the door is Lake George. We'll see more of that later. Here are three finished hearts. The project was for nine hearts with a ruffled-looking edge. 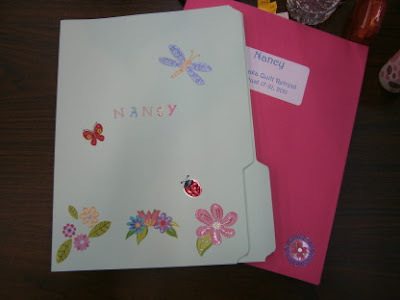 These were done by Nancy, Gale, and Sandy, who decided to add a 10th heart to hers. Tomorrow--more pictures of these ladies and their projects. And there is a tale of daring-do coming in the next few days--stay tuned! Ahhhh...school supplies! This time of year makes those of us with an office/school supply addiction salivate. To help fuel your creativity, here is a project that's perfect to use at home or in a class. Check it out! 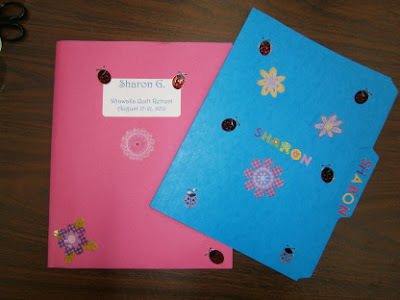 Sandy decorated not only her sandpaper folder but her class folder as well. 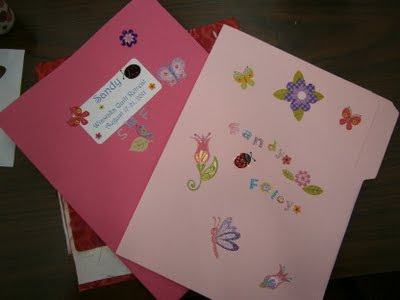 Sharon G's penchant for ladybugs is readily apparent! Nancy was more reserved, but equally artful. 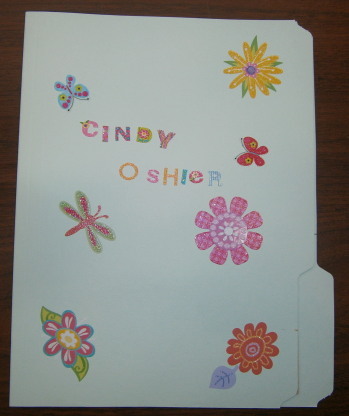 Cindy decided to take no chances--first and last name--so no one else could claim her prize! And here is my version. 13 is my lucky number, so I used that instead of my last name because we were out of S's! Who knew we needed so many! It was a fun time, reminding us of how much fun we can have with such simple things. Join the fun and make your own. When it gets ratty, you can trash it and start over--the fun never ends! 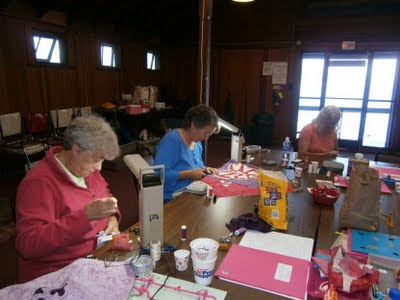 Over the next several posts you will see what other creative things these ladies did over the course of three days. We had so much fun it should have been illegal! P.S. I've listened to 10th Anniversary by James Patterson and Maxine Paetro and am now listening to Treachery in Death by J.D. Robb. And I'm reading Outfoxed by Rita Mae Brown. I've been reluctant to post yet another picture-less blog, but I guess that's marginally better than no blog at all. Things have been hopping here. 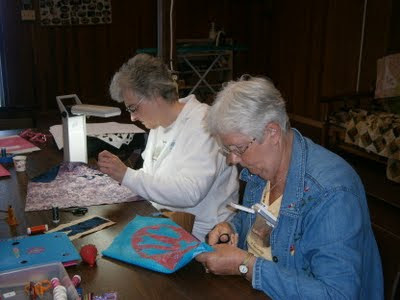 Scheduling new classes, working on the new hand piecing sample (one of the things I will take pics of--hopefully soon! ), teaching classes, driving to and from classes (PLEASE beam me up, Scotty! ), plus the usual day-to-day stuff at home. I've listened to lots of books while working on the new quilt--Bel Air Dead by Stuart Woods, Chasing Fire by Nora Roberts, A Thin Dark Line by Tami Hoag. I've also spent a fair amount of time in the car listening to the 20th Anniversary Edition of music from Dirty Dancing. Can we say Hubba Hubba about Patrick Swayze? Okay, and Brett Cullen. Or insert your own hunka hunka.